Jan Chryzostom Pasek in the Battle of Lachowicze (1660), a Juliusz Kossak painting. Russian annexation of left-bank Ukraine, Kiev and Smolensk. The Russo-Polish War of 1654–1667, also called the Thirteen Years' War, First Northern War, War for Ukraine or Russian Deluge (Polish: Potop rosyjski, Russian: Российский потоп, Lithuanian: Rusų tvanas), was a major conflict between the Tsardom of Russia and the Polish–Lithuanian Commonwealth. Between 1655 and 1660, the Swedish invasion was also fought in the Polish-Lithuanian Commonwealth and so the period became known in Poland as "The Deluge" or Swedish Deluge. Because of this, it is sometimes referred as Russo–Swedish Deluge (Polish: Potop szwedzko-rosyjski). The Commonwealth initially suffered defeats, but it regained its ground and won most of the battles. However, its plundered economy was not able to fund the long conflict. Facing internal crisis and civil war, the Commonwealth was forced to sign a truce. The war ended with significant Russian territorial gains and marked the beginning of the rise of Russia as a great power in Eastern Europe. The conflict was triggered by the Khmelnytsky Rebellion of Zaporozhian Cossacks against the Polish-Lithuanian Commonwealth. The Cossack leader, Bohdan Khmelnytsky, derived his main foreign support from Alexis of Russia and promised his allegiance in recompense. 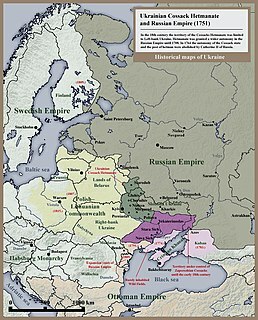 Although the Zemsky Sobor of 1651 was poised to accept the Cossacks into the Moscow sphere of influence and to enter the war against Poland-Lithuania on their side, the Tsar waited until 1653, when a new popular assembly eventually authorized the protectorate of Ukraine with Tsardom of Russia. After the Cossacks ratified this agreement at the Pereyaslav Council the Russo-Polish War became inevitable. In July 1654 the Russian army of 41,000 (nominally under the Tsar, but in fact commanded by Princes Yakov Cherkassky, Nikita Odoevsky and Ivan Khovansky) captured the border forts of Bely and Dorogobuzh and laid siege to Smolensk. The Russian position at Smolensk was endangered as long as Great Lithuanian Hetman, Prince Janusz Radziwiłł, with a 10,000 man garrison, held Orsha, slightly to the west. Cherkassky took Orsha; forces under his command, led by Kniaz (Prince, or Duke) Yuri Baryatinsky, forced Radziwill to retreat in the Battle of Shklov (also known as the Battle of Szkłów, Battle of Shkloŭ, or Battle of Shklow, which took place during a solar eclipse, and for which both sides claimed victory), fought near Shklov on August 12. Radziwill was again defeated twelve days later at the Battle of Shepeleviche. After a three-month siege, Smolensk — the main object of the previous Russo–Polish War — fell to the Russians on 23 September. In the meantime, Prince Aleksey Trubetskoy led the southern flank of the Russian army from Bryansk to Ukraine. The territory between the Dnieper and Berezina was overrun quickly, with Trubetskoy taking Mstislavl and Roslavl and his Ukrainian allies capturing Homel. On the northern flank, V.B. Sheremetev set out from Pskov and seized the Lithuanian cities of Nevel (July 1), Polotsk (July 17), and Vitebsk (November 17). Thereupon the Tsar's troops in December swarmed over Polish Livonia and firmly established themselves in Ludza and Rezekne. Simultaneously, the combined forces of Khmelnitsky and the Russian Boyar Buturlin struck against Volynia. Despite many disagreements between the commanders, they took hold of Ostroh and Rivne by the end of the year. In the winter and spring of 1655, (Prince) Radziwill launched a counter-offensive in Belarus, recapturing Orsha and besieging Mogilyov. This siege continued for three months with no conclusion. In January, Sheremetev and Khmelnitsky were defeated at the Battle of Okhmativ, while a second Polish army (allied with the Tatars) crushed a Russian-Ukrainian contingent at Zhashkov. Alarmed by these reverses, the Tsar hastened from Moscow and at his instigation a massive offensive was launched. The Lithuanian forces offered little effective resistance and surrendered Minsk to the Cossacks and Cherkassky on 3 July. Vilnius, the capital of the Great Duchy of Lithuania, was taken by the Russians on 31 July. This success was followed up by the conquest of Kaunas and Hrodno in August. Elsewhere, Prince Volkonsky sailed from Kiev up the Dnieper and the Pripyat, routing the Lithuanians and capturing Pinsk on his way. Trubetskoy's unit overran Slonim and Kletsk, while Sheremetev managed little beyond seizing Velizh on June 17. A Lithuanian garrison still resisted the Cossacks' siege in Stary Bykhov, when Khmelnitsky and Buturlin were already active in Galicia. They attacked the Polish city of Lwów in September and entered Lublin after Pawel Jan Sapieha's defeat near Brest. The Russians advance into the Polish-Lithuanian Commonwealth led to the kingdom of Sweden invading Poland in 1655 under King Charles X.
Afanasy Ordin-Nashchokin then opened negotiations with the Poles and signed an armistice, Truce of Vilna, on 2 November. After that, Russian forces marched on Swedish Livonia and besieged Riga in the Russo-Swedish War (1656–1658), a theater of the Second Northern War. Khmelnytsky was not against this temporary truce and supported the Tsar though he warned him of Polish furtiveness. Ivan Vyhovsky, the newly elected hetman in 1657 upon the death of Khmelnytsky, allied himself with the Poles in Sept. 1658, creating the Grand Duchy of Ruthenia. 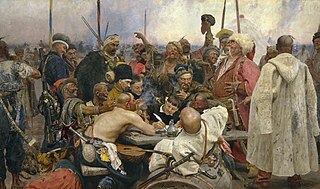 However, the Cossacks were also beset with the start of a civil war with this Commonwealth treaty and a new Treaty of Pereyaslav with Russia in 1659. The Tsar concluded with Sweden the advantageous Treaty of Valiersar, which allowed him to resume hostilities against the Poles in October 1658, capturing Wincenty Gosiewski at the Battle of Werki. In the north, Sapieha's attempt to blockade Vilnius was checked by Prince Yury Dolgorukov [ru] on October 11. In the south, the Ukrainian Vyhovsky failed to wrest Kiev from Sheremetev's control where Russians kept their garrison. In July 1659, however, Vyhovsky and his Crimean Tatar allies inflicted a heavy defeat upon Trubetskoy's army, then besieging Konotop. The threat to the Russians during their conquests in Ukraine was relieved after Vyhovsky lost his alliance with Crimean Khanate due to Kosh Otaman Ivan Sirko campaign who later attacked Chyhyryn as well. An uprising arose in the Siever Ukraine where Vyhovsky stationed few Polish garrisons. During the uprising perished a Ukrainian nobleman Yuri Nemyrych who was considered the original author of the Hadyach Treaty. Together with the Uman colonel Mykhailo Khanenko Sirko has led a full scale uprising throughout Ukraine. The mutinied Cossacks requested Vyhovsky to surrender the hetman's attributes and reelect Khmelnitsky's son Yurii once again as the true hetman of Ukraine. Both forces faced off near the village of Hermanivka. There the rest of cossacks deserted Vyhovsky and rallied under Yuri Khmelnytsky, while Vyhovsky was left with the Polish troops and other mercenaries. A council was gathered with participation of both sides where the union with Poland-Lithuania was proclaimed unpopular and due to the rising arguments and threats Vyhovsky has left the meeting. The council elected Khmelnytsky the new hetman and an official request to surrender the power was sent to Vyhovsky who had no other choice as to comply. Russian forces stunned at Konotop tried to renegotiate a peace treaty on any terms. However, the change of powers within the Cossack Hetmanate reflected the amount influence of the Russian foreign policy in Ukraine and reassured voivode Trubetskoi. Trubetskoi invited Khmelnytsky to renegotiate. Advising by starshyna not to rush it Yuri Khmelnytsky sent out Petro Doroshenko with an official request. Trubetskoi, however, insisted on the presence of the hetman to sign the official treaty at Pereyaslav (see Pereyaslav Articles). Arriving there Khmelnytsky discovered that he was ambushed. Most of the eastern areas marked with light orange were lost by Commonwealth to Russia in 1667; the rest were lost in Grzymułtowski's Peace Treaty of 1686. The tide turned in favor of the Polish-Lithuanian Commonwealth in 1660. King John II Casimir, having concluded the Second Northern War against Sweden with the Treaty of Oliva, was now able to concentrate all his forces on the Eastern front. :186 Sapieha and Stefan Czarniecki defeated Khovansky at the Battle of Polonka on 27 June. :186 Then, Potocki and Lubomirski attacked V.B. Sheremetev in the Battle of Cudnów and forced him to capitulate on 2 November, after persuading Yurii Khmelnytsky to withdraw on 17 October. :186 These reverses forced the Tsar to accept the Treaty of Kardis, by way of averting a new war against Sweden. In addition to the territorial changes from the war, this conflict sparked major changes in the Russian military. While the Russian army was still a "semi-standing, mobilized seasonally", this conflict moved it along the path toward a standing army, laying the groundwork for Russian military successes under Peter the Great and Catherine the Great. ^ a b c d e f g Frost, Robert I (2000). The Northern Wars. War, State and Society in Northeastern Europe 1558–1721. Longman. p. 13. ISBN 978-0-582-06429-4. ^ a b (in Polish) Kubala L. WOJNA MOSKIEWSKA. R. 1654–1655. SZKICE HISTORYCZNE, SER.III, WARSZAWA, 1910: Chapter VII, Bitwa pod Szkłowem i pod Szepielewiczami Archived 2015-07-01 at the Wayback Machine also available as John III Sobieski (King of Poland) (1845). Ojczyste spominki w pismach do dziejów dawnéj Polski: diaryusze, relacye, pamiȩtniki ... Tudzież listy historyczne do panowania królów Jana Kazimierza i Michała Korybuta, oraz listy Jana Sobieskiego. J. Cypcer. pp. 114–115. Retrieved April 20, 2011. ^ Грамоты из переписки царя Алексея Михайловича с Богданом Хмельницким в 1656 г. ^ Agoston, Gabor (Spring 2011). "Military Transformation in the Ottoman Empire and Russia, 1500-1800". Kritika. 12 (2): 284. Retrieved 10 June 2012. Malov, A. V. (2006). 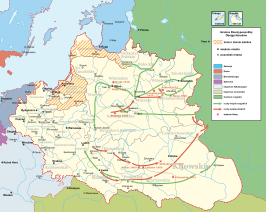 Russo-Polish War (1654–1667). Moscow: Exprint. ISBN 5940381111. Wikimedia Commons has media related to Polish-Russian War 1654-1667. Zynoviy Bohdan Khmelnytsky was a Ukrainian Hetman of the Zaporozhian Host of the Crown of the Kingdom of Poland in the Polish–Lithuanian Commonwealth. He led an uprising against the Commonwealth and its magnates (1648–1654) that resulted in the creation of a state led by the Cossacks of Ukraine. In 1654, he concluded the Treaty of Pereyaslav with the Tsardom of Russia. The term Deluge denotes a series of mid-17th-century campaigns in the Polish–Lithuanian Commonwealth. In a wider sense it applies to the period between the Khmelnytsky (Chmielnicki) Uprising of 1648 and the Truce of Andrusovo in 1667, thus comprising the Polish theatres of the Russo-Polish and Second Northern Wars. In a stricter sense, the term refers to the Swedish invasion and occupation of the Commonwealth as a theatre of the Second Northern War (1655–1660) only; In Poland and Lithuania this period is called the Swedish Deluge, or lesser known as Russo–Swedish Deluge, due to the Russian invasion in 1654, also known as Russian Deluge in Poland, and the term deluge was popularized by Henryk Sienkiewicz in his novel The Deluge (1886). Hetman of Zaporizhian Cossacks is a historical term that has multiple meanings. Ivan Vyhovsky was a hetman of the Ukrainian Cossacks during three years (1657–59) of the Russo-Polish War (1654–1667). He was the successor to the famous hetman and rebel leader Bohdan Khmelnytsky. His time as hetman was characterized by his generally pro-Polish policies, which led to his defeat by pro-Russian faction among the Cossacks. 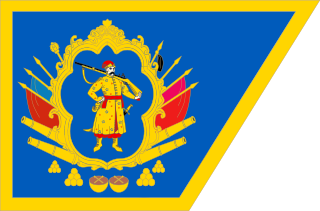 The Cossack Hetmanate, officially known as the Zaporizhian Host was a Ukrainian Cossack host in Central Ukraine between 1649 and 1764. The Treaty of Hadiach was a treaty signed on 16 September 1658 in Hadiach between representatives of the Polish–Lithuanian Commonwealth and Ukrainian Cossacks. It was designed to elevate the Cossacks and Ruthenians to the position equal to that of Poland and Lithuania in the Polish–Lithuanian union and in fact transforming the Polish–Lithuanian Commonwealth into a Polish–Lithuanian–Ruthenian Commonwealth. Ivan Bohun was a Ukrainian Cossack colonel. Close associate and friend of Bohdan Khmelnytsky, he opposed both the pacts with Polish-Lithuanian Commonwealth and with Tsardom of Russia. Prince Aleksey Nikitich Trubetskoy was the last voivode of the Trubetskoy family and a diplomat who was active in negotiations with Poland and Sweden in 1647 and with the ambassadors of Bohdan Khmelnytsky in 1654. He was the godfather of Peter I of Russia. Pavlo Teteria (1620s–1670) was Hetman of Right-bank Ukraine (1663–1665). His real name is Pavlo Morzhkovsky. Before his hetmancy he served in a number of high positions under Bohdan Khmelnytsky, and Ivan Vyhovsky. The Battle of Chudnov took place from 14 October to 2 November 1660, between the forces of the Polish-Lithuanian Commonwealth, allied with the Crimean Tatars, and the Tsardom of Russia, allied with the Cossaks. It ended with a decisive Polish victory, and the truce of Chudnov. The entire Russian army, including its commander, was taken into jasyr slavery by the Tatars. The battle was the largest and most important Polish victory over the Russian forces until the battle of Warsaw in 1920. The Unknown War is a military history book written by Hienadz Sahanovich. It describes the events of the war between Tsardom of Russia and the Polish–Lithuanian Commonwealth in 1654-67. The war has become known as a part of the "Deluge", a series of military conflicts that overwhelmed the Polish–Lithuanian Commonwealth in the middle of the 17th century which included the Khmelnytsky Uprising, the Swedish invasion, and the Russian invasion among others. Hetman of Zaporizhian Host is a former historic government office and political institution of Cossack Hetmanate in Ukraine that was equivalent to a head of state. The office was liquidated on the edict of Russian Governing Senate of 17 November 1764.